ABOVE: The Hotel Antiche Figure is on the Grand Canal, directly across from the railroad station (where this photo was taken). INSET BELOW: The lobby, the hotel's 15th Century building, and tables on the fondamenta next to the canal. 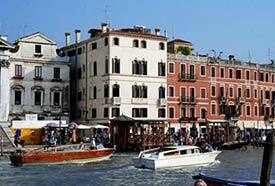 Location: On the Fondamenta S. Simeon Piccolo, facing the railway station across the Grand Canal. You're arriving or departing by train, or you're entering or leaving Venice at the Piazzale Roma (which also is just a short walk from the hotel). The Hotel Antiche Figure has extremely high guest ratings from customers of our booking partners, and it certainly has a lot to offer: The hotel is convenient to transportation, rooms with canal views are available, the staff at the reception desk are friendly, and Internet access is free. You'll also enjoy the setting: The Antiche Figure faces a fondamenta next to the Grand Canal next to the San Simeon Piccolo Church, and if you head inland via the street alongside the hotel, you can reach the Frari Church and other important sights just by following other tourists and locals. In the first image, you can see the Santa Lucia Railroad Station at upper left. In the lower left corner of the frame is the Piazzale Roma, which has airport buses, land taxis, shuttle buses to the cruise port, and the People Mover to the Marittima ship basin and the Tronchetto parking garage. The Hotel Antiche Figure is directly across from the train station (via the Scalzi Bridge, top of photo). The second photo shows the Hotel Antiche Figure, which is the first waterfront building to the right of the green-domed San Simeon Piccolo Church.